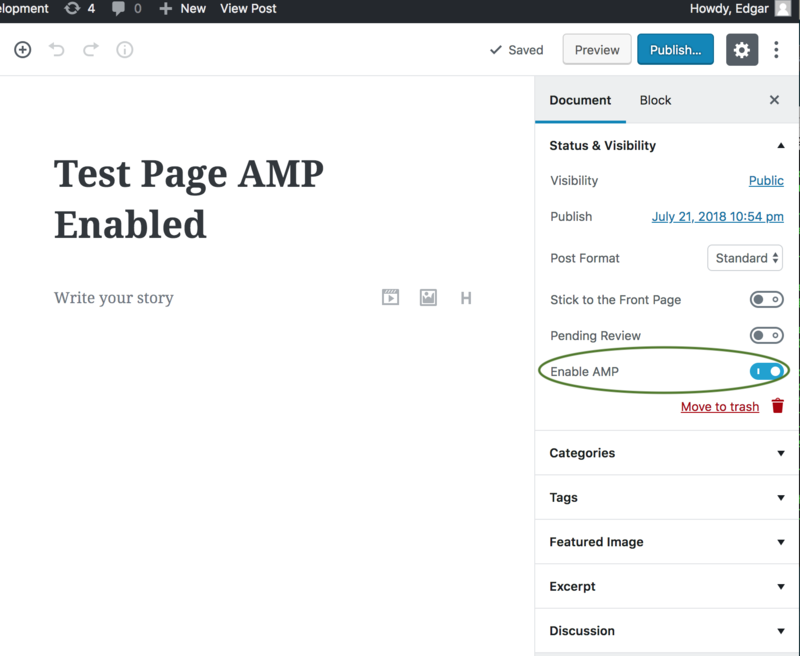 This adds the 'Enable AMP' toggle to the Gutenberg editor. This should have the initial enabled value, probably from AMP_Post_Meta_Box. It could also have the notifications that the classic editor has, if needed. 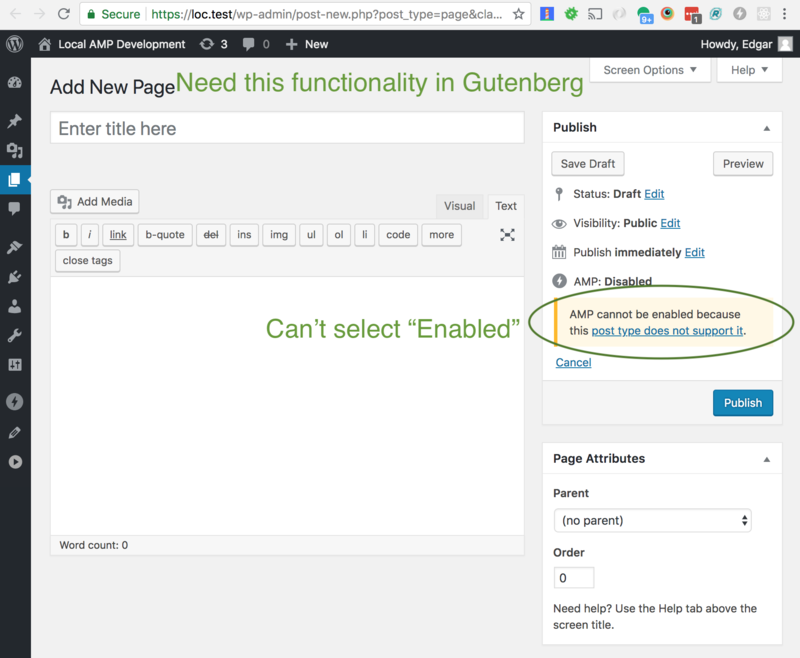 Begin Gutenberg 'Enabled AMP' toggle. that the classic editor has, if needed. Refactor JS file to use a module patter. 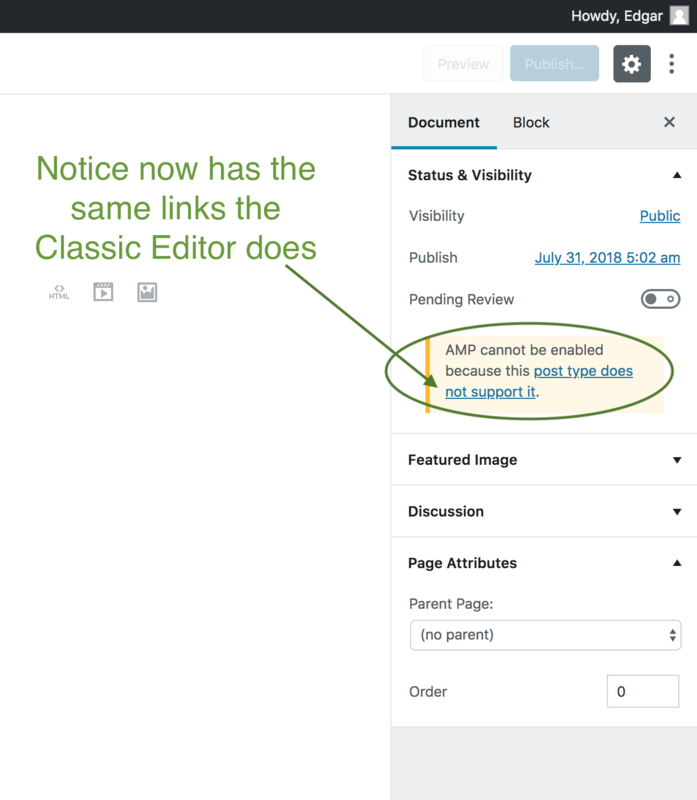 Also, rename it to clarify that it's for Gutenberg. as the name probably won't remain after its Core merge. Abstract logic to get enabled status into helper method. This enables reusing it for the block toggle. Also, add a PHPUnit test for this. This is mainly copied from test_render_status(). Add assertions for inline script. And other functions, like onAmpChange() and getEnabledStatus(). Address Travis error by removing blank line. Meaning the notices shown when expanding the toggle to edit? Yes, that's what I had in mind. Good point that they would have to be shown without the toggle to expand. 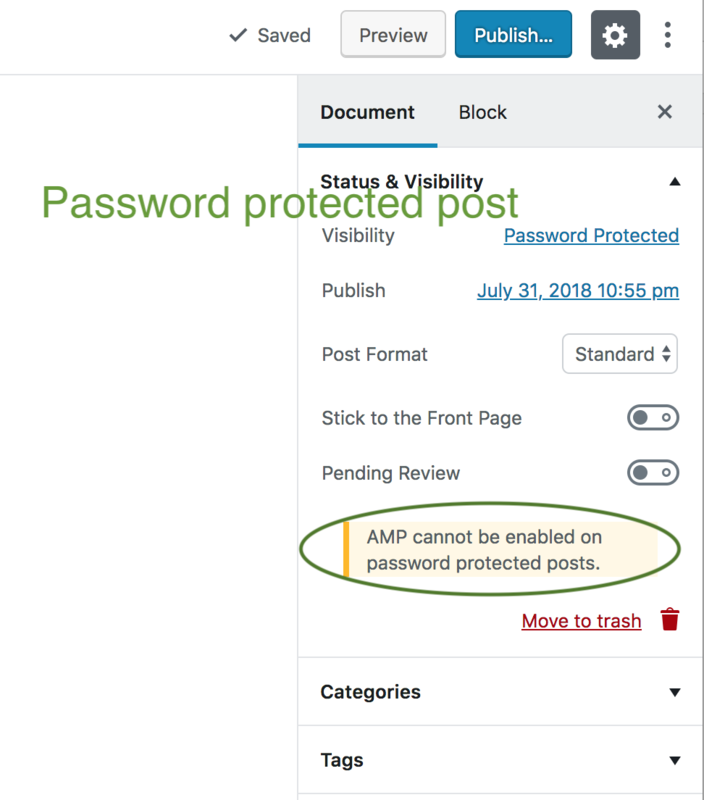 This needs to be done for https://github.com/Automattic/amp-wp/blob/develop/assets/js/amp-block-validation.js and https://github.com/Automattic/amp-wp/blob/develop/assets/js/amp-editor-blocks.js as well. This would allow for being able to use Babel to handle i18n and it would allow for the scripts to all be concatenated into a single build script. Sure, Issue #1298 now tracks bundling this amp-block-editor-toggle.js module with amp-block-validation.js. We could also add converting amp-editor-blocks.js to a module. and we could use Babel for internationalization. All of these scripts might eventually be in a single script. But this only affects 1 script now. Begin to convert AMP block editor toggle to a module. There will probably be styling issues to correct. The ternary conditional doesn't really need a (). as it had used a variable in the global scope. And other AMP Gutenberg scripts could possibly use this. The next step is to apply something like the Classic Editor UI. 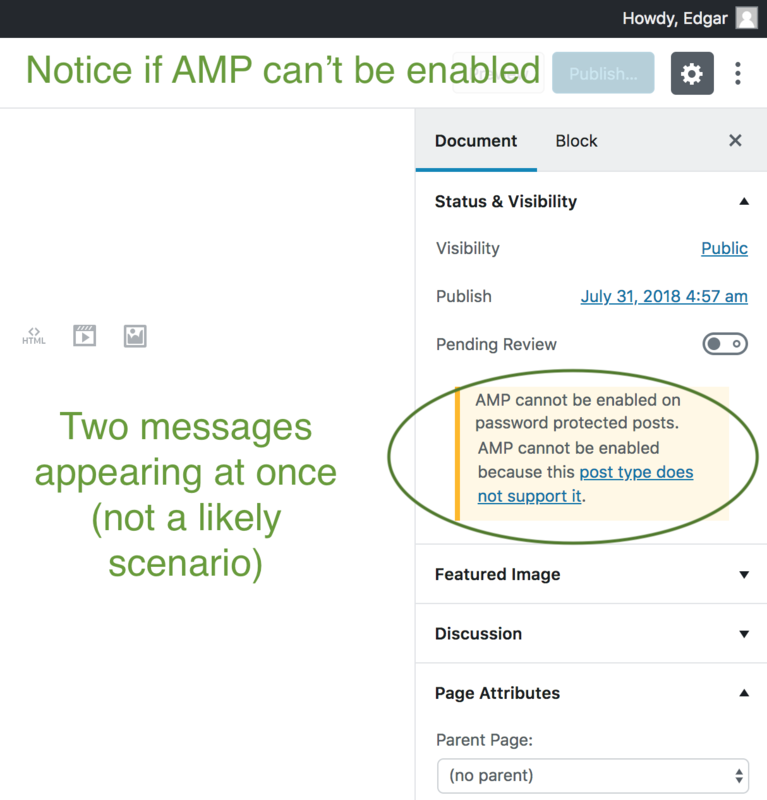 If AMP is disabled via errors, you shouldn't be able to select "Enabled." Good idea, I'll apply that. Could this instead combine amp-block-editor-toggle-compiled.js with any future modules, like amp-block-validation.js (when that's converted to a module)? It looks like assets/js/amp-blocks-compiled.js is only enqueued if amp_is_canonical(). Good point on amp-blocks-compiled.js. Maybe that would make sense to be a separate bundle then. Either that, or there could be an arg passed for whether the blocks should be registered. But if not, then why include the file in the first place? So amp-block-validation.js and amp-block-editor-toggle-compiled.js should definitely be combined. @kienstra One more thing for that issue you'll create: please add to it the need to generate source maps. @westonruter, @kienstra and I synced up in slack. He'll open the issue. 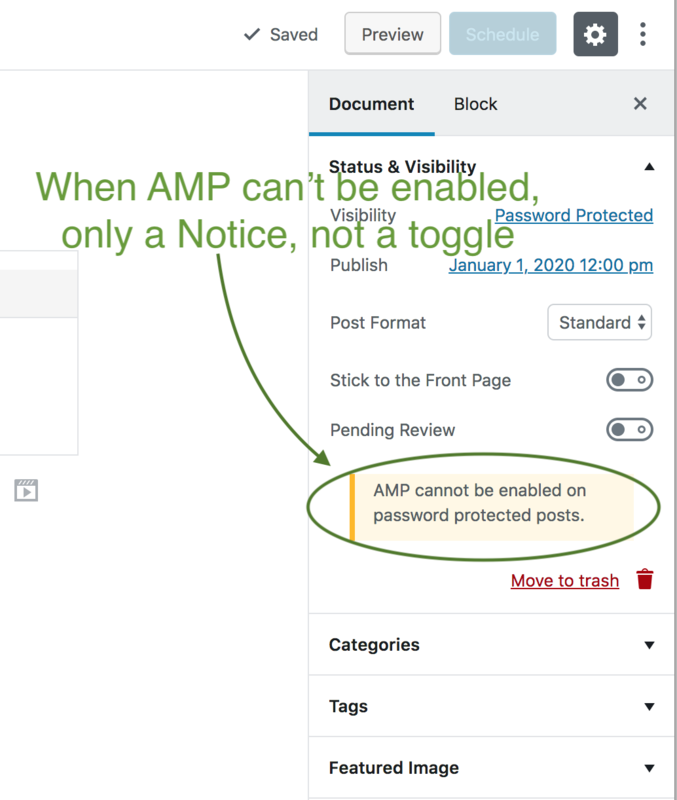 Once we resolve the issues in amp-block-validation.js, then we can green light the task. 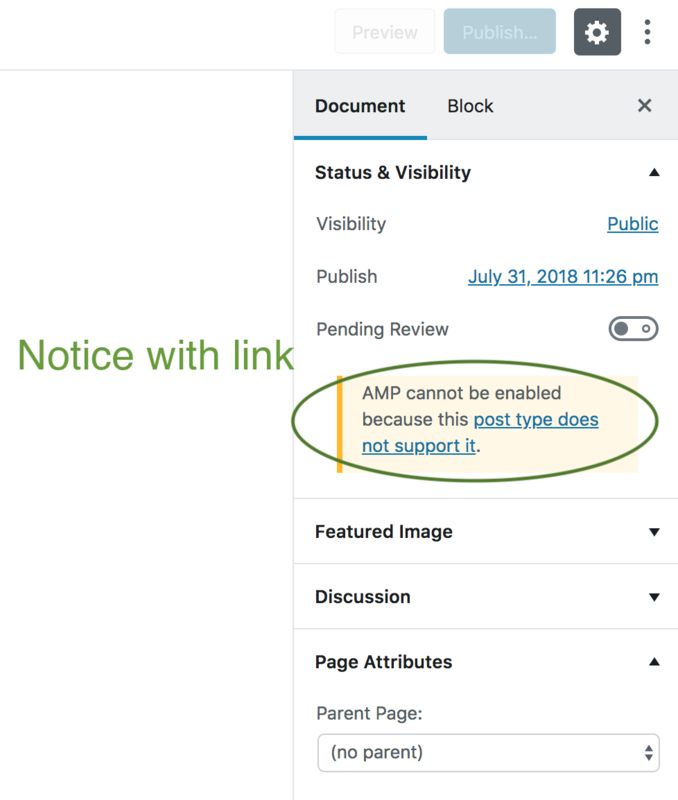 Issue #1298 now tracks bundling amp-block-editor-toggle.js with amp-block-validation.js. It also mentions that it's probably best to wait for #1293.
like they display in the Classic Editor. @todo: handle <a> elements, as they are escaped. Output Notices with links in the block editor. This has the text of the message and the href. is contructed in the Notice. for all of the compiled JS files. Only call gutenberg_get_jed_locale_data() if it exists. the gutenberg_ prefix might be removed from functions. So only call this function if it exists. This section is moved to get_raw_error_messages(). Instead, simply pass it to the funtion. Could you please review this PR? * @param array $raw_error_messages The raw error messages, possibly with URLs. * @return array $error_messages The error message(s), as an array of strings. There is duplication between PHP here and the JS in PluginPostStatusInfo. I appreciate the concern to not dangerouslySetInnerHTML but since the error messages are coming from a trusted source, I think it would be better to do so in this case. Even in Gutenberg, for example, there is a RawHTML component for this purpose. This component is publicly available already in Gutenberg via wp.element.RawHTML. Thanks, I'm working on this now. These commits simplify the error messages to use RawHTML like you suggested. Simplify error messages to use RawHTML. it's possible to construct elements using RawHTML. to just use a string. Fix test_get_error_messages() to apply latest change. so update this for them. I noticed the error when adding a new Jetpack Testimonial post. Also switch to from classic functions to arrow functions. @kienstra You've written some beautiful JS here. Great work.